Yesterday we boarded buses and set out for a most interesting tour about the landscape and topography of a future peace agreement. We first met with Danny Siedemann, a lawyer and leading proponent of the Israeli peace camp, who argued that any peace agreement begins and ends where we stood in East Jerusalem's Sheikh Jarrah. 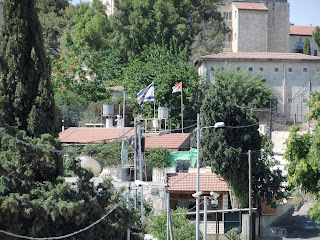 Despite the neighborhood's overwhelmingly Arab character in recent years Jews have moved into a number of homes and established a Jewish enclave there. They have made the grave of Shimon HaTzaddik into a Jewish pilgrimage site. In Danny's view if such "settlements" are allowed to continue it will destroy any hope of a two-state solution, by eliminating the possibility of Palestinian contiguity. A divided land represents the only hope for peace. It is ugly but it is the reality of this place and promises the best future. Two nations for two peoples. From this overlook we traveled to the West Bank community (settlement) of Beit Aryeh. It is a modest community of Israelis who primarily work in the aircraft industry. They are not religious ideologues. They live there because of the settlement's proximity to Ben Gurion airport. It is like any small town. It is not a few trailers on a hilltop. There are street signs and street cleaners. There are parks and community centers. There we meet with retired Colonel Danny Terza, the chief architect of the seam zone barrier that was erected during the second intifada to prevent terror attacks. Something it helped to successfully curtail. He explained to us the importance of retaining control of the hilltops in order to guarantee Israel's security. The afternoon offered a hazy sky, but still with little effort, we could make out the runway of Israel's international airport. 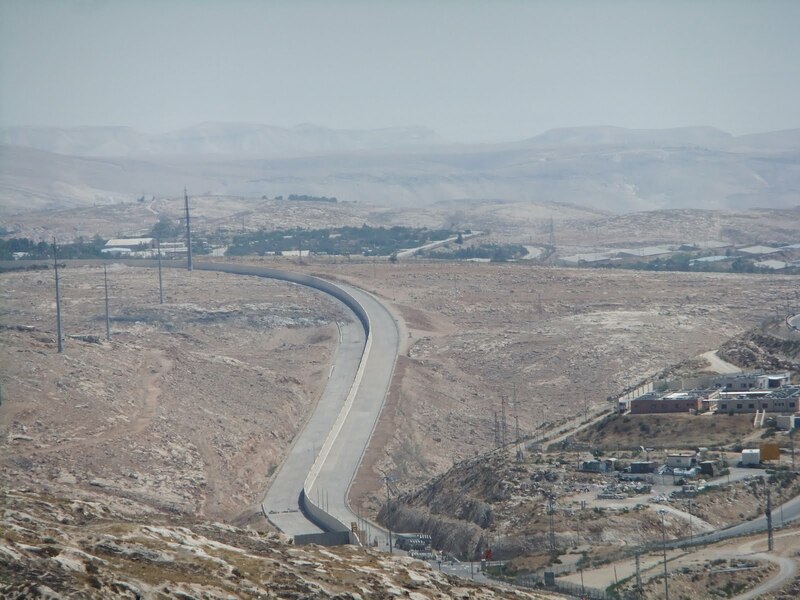 How could Israel relinquish security control over all of the West Bank? When looking at a map it is impossible to appreciate how the land's mountains and valleys come into play. Standing here, peering at Ben Gurion's runway in the visible distance, we better appreciated the importance of the West Bank in terms of Israel's security. We continued to travel the roads of the territories. 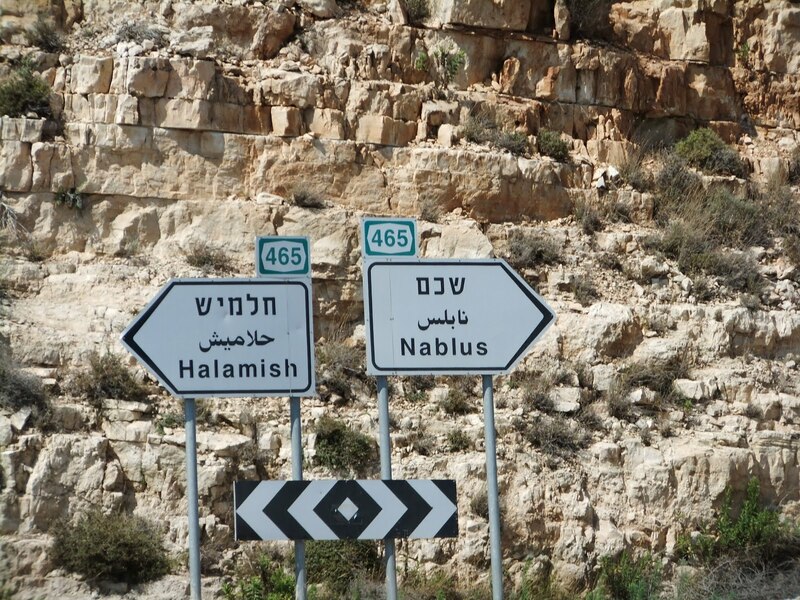 To the left, the settlement of Halamish, to the right the Palestinian town of Nablus. Our bus turned off the main road into the West Bank's Area A. In the Oslo Accords Area A came to enjoy full Palestinian control, as opposed to Area C where Israel maintains complete control. 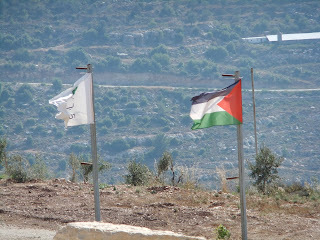 In Area B Israel maintains control over security and the Palestinians over civilian affairs. We were escorted by a Palestinian jeep through Arab towns to the site of the future town of Rawabi. Israelis no longer travel to such places and do not travel in Area A. Although we were traveling in a bullet proof bus I never once felt unsafe. There we met with developer Bashar El Masri, a wealthy Palestinian who hopes to transform the current situation from conflict into peace while still making a profit. He is developing the first Palestinian planned city. Imagine Columbia, Maryland only in the middle of the West Bank. He believes that building such a city and addressing the socio-economic issues will help to create the opportunities for peace. Like the settlers he is also creating facts on the ground. If he succeeds there will soon be impressive Palestinian facts alongside Jewish facts on this land. I wonder if the facts are less about reality and more about what you believe. Here you can deny the others' facts just as easily as you create your own. Whose language do you speak? Whose facts do you support? I was also left pondering this observation. Many Israelis speak of security and history. This Palestinian, and his employees, spoke of peace and the future. In a world that embraces youth and technology speaking of the past will not endear us to the world. With such eloquent spokesmen who will win over the hearts of the world? And even more important to this rabbi, who will win over the hearts of our young people? Their language is as well one of peace and the future.